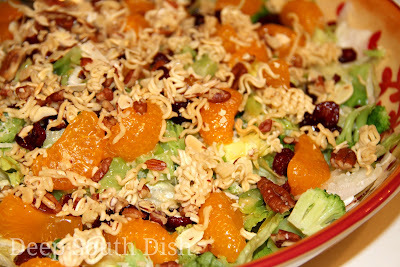 Anything and Everything Salad - a mixture of lettuces and various toppings, here topped with broccoli, bacon, mandarin oranges, dried cranberries, dressed with a sweet and sour dressing and topped with a buttery almond, pecan and ramen noodle crunch. I love this salad. It's sort of a hybrid of Ramen Noodle Salad and Broccoli Salad with a few extras thrown in. Really it can be made with whatever add-ins you like and, in fact, it's often referred to as "Anything and Everything Salad." Start with your favorite mix of lettuces, romaine, spring mix, fresh baby spinach, or mixed baby greens are good choices. Add in a choice of fruits like chopped apple, mandarin oranges, tangerines, pineapple chunks, cubed cantaloupe and other melons, sliced pears, hulled and sliced strawberries, grapes or pomegranate arils. Enhance those with golden or dark raisins, dried cranberries, or other chopped dried fruit like apricots, peaches or apples. Add in shredded carrots, sliced cherry tomatoes, cucumbers, white, red or yellow onion, and seeds and nuts like sunflower and pumpkin seeds, pecans, cashews, walnuts or macadamias. Add proteins like smoked ham strips, grilled chicken, shrimp, or beef, or cooked, crumbled bacon and chopped hard boiled eggs. Whatever you like, anything and everything! If you like to add a salad to your holidays, this is the one. It's made with a sweet and sour dressing we love so much in the south and with the inclusion of some fruit, it's sweet enough that everybody loves it. It will disappear from the table. Plus, it's easy to throw together even at the last minute and it's pretty. The ramen noodle crunchies that are thrown in are so good that I insist that you absolutely must use them. I love to make a double batch to have some at the table so that everybody can add plenty to their own plates. Did I mention that I really love this salad? Preheat oven to 400 degrees F. In a small bowl, mix the ramen noodles, almonds and pecans; sprinkle with salt and pour melted butter on top and toss. Transfer to a baking sheet and toast in the oven, stirring occasionally, until browned, about 10 minutes. Set aside to cool until ready to serve the salad. Whisk together the dressing ingredients and refrigerate until needed. When ready to serve, add all of the salad ingredients to a large salad bowl in the order listed, crack some fresh pepper on top and drizzle about half of the dressing on top, or just enough to lightly coat the lettuce. Add half of the topping; toss. Sprinkle on the remaining topping but reserve the remaining dressing for the table. Serve immediately. Cook's Notes: Omit the salt in the topping if you use regular salted butter. For a main dish salad, add in a protein, like smoked ham cut into strips, or grilled chicken, shrimp, or beef. Swap-outs and Add-ins: Fresh baby spinach, mixed baby greens, chopped apple, sliced pears, tangerines, hulled and sliced strawberries, pineapple chunks, cubed cantaloupe and other melons, pomegranate arils, raisins, carrots, sliced cherry tomatoes, fresh avocado, white, red or yellow onion, cucumber, other dried fruits, chopped, other seeds and nuts such as sunflower and pumpkin seeds, cashews, walnuts or macadamias, crisped prosciutto, pepperoni, salami or chopped, hard boiled eggs. Tip: You can prep the ingredients ahead, but don't assemble the salad until just before you're ready to serve it. Toss fruits and veggies that oxidize quickly with lemon juice to prevent browning. Double the topping ingredients if you want to have some extra for the table. Trust me, you want to. This looks so good Mary! I also adore the crunchy ramen noodles in salads. Any recipe that has them always catches my eye! I usually brown them along with the nuts in a skillet but I'm sure your oven method does the same trick. Some of the recipes I've come across just tell you to throw the noodles in without browning them - I can't imagine doing it that way so I've never tried it! I love the warm toasty flavor you get from browning them... In fact, we usually just snack on the darn things so I always have to double or triple the amount of noodles! They aren't bad raw, but they sure are good toasted aren't they? I know what you mean about the snacking... they are THAT good!!! I like how this brings not only a lot of flavors but also varied textures too. Crispy crunchy ramen, yes! I have had this on my frig since 11/20/12. I made it today and the grandkids picked out the things they didn't like which were few and my DIL had trouble restraining herself because she just wanted to lick the salad bowl clean. 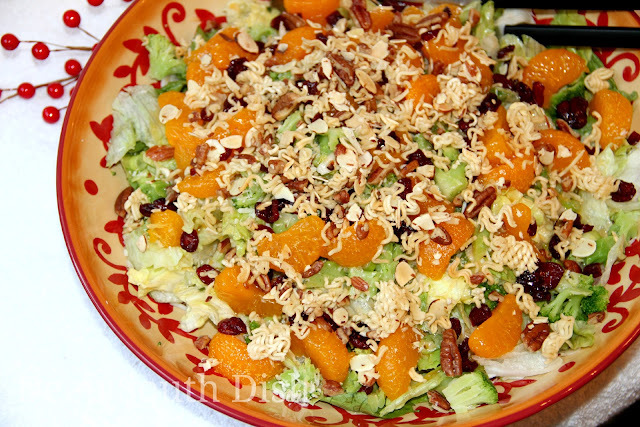 (wink) All 9 of us thoroughly enjoyed this salad with the sweet dressing flavor and we will be making it again, soon! Cynthia, I can totally relate to the "lick the bowl" thing LOL!! I'm so glad they enjoyed it & thank you for stopping back by to let me know! That really means a lot to me. Happy New Year! !